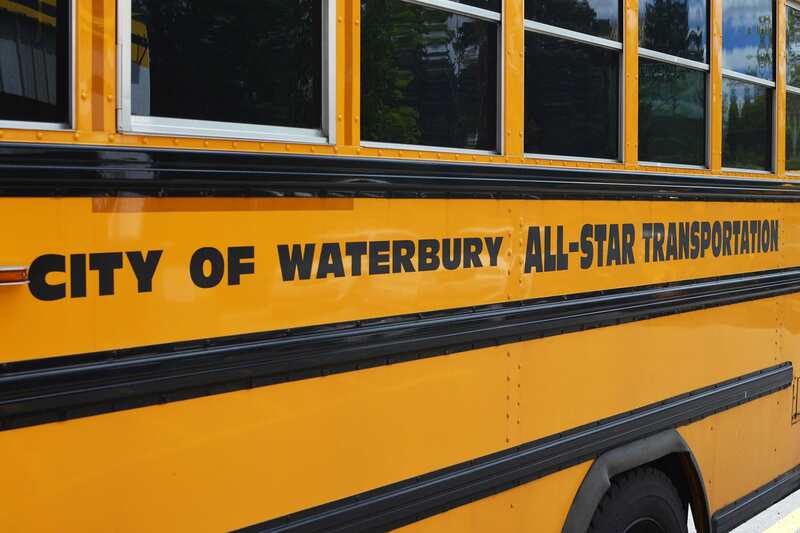 All-Star Transportation’s Waterbury office serves students with special needs and those enrolled in early childhood programs. Its bus routes are not on the Waterbury schools website and can change daily. Parents / Guardians can call Waterbury dispatch at 203-753-8366 to confirm bus numbers. Please do not worry if a bus is late, especially at the start of a school year when it typically takes a few days for kindergarten children and new students to become accustomed to the bus routes and schedules. If, however, you have concerns about your bus being consistently late over a period of several days, please contact the Waterbury office at 203-753-8366. Crosby High School – 7:20 a.m. – 1:50 p.m.
Kennedy High School – 7:20 a.m. – 1:50 p.m.
Waterbury Arts Magnet School – 7:25 a.m. – 1:55 p.m.
Waterbury Career Academy High School – 7:20 a.m. – 1:50 p.m.
Wilby High School – 7:20 a.m. – 1:50 p.m.
North End Middle School – 7:50 a.m. – 2:20 p.m.
Wallace Middle School – 7:50 a.m. – 2:20 p.m.
West Side Middle School – 7:50 a.m. – 2:20 p.m. Bucks Hill Elementary School – 8:35 a.m. – 2:50 p.m.
Bunker Hill Elementary School – 8:35 a.m. – 2:50 p.m.
B.W. Tinker Elementary School – 8:05 a.m. – 2:20 p.m.
Carrington Elementary School – 8:35 a.m. – 2:50 p.m.
Chase Elementary School – 8:35 a.m. – 2:50 p.m.
Driggs Elementary School – 8:05 a.m. – 2:20 p.m.
Duggan Elementary School – 8:05 a.m. – 2:20 p.m.
E.J. Kingsbury Elementary School – 8:35 a.m. – 2:50 p.m.
Generali Elementary School – 8:35 a.m. – 2:50 p.m.
John G. Gilmartin Elementary School – 8:35 a.m. – 2:50 p.m.
Hopeville Elementary School – 8:35 a.m. – 2:50 p.m.
Maloney Magnet Elementary School – 8:35 a.m. – 2:50 p.m.
Jonathan Reed Elementary School – 8:35 a.m. – 2:50 p.m.
Regan Elementary School – 8:35 a.m. – 2:50 p.m.
Rotella Interdistrict Magnet School – 9:05 a.m. – 3:20 p.m.
Sprague Elementary School – 8:05 a.m. – 2:20 p.m.
Walsh Elementary School – 8:05 a.m. – 2:20 p.m.
Washington Elementary School – 8:05 a.m. – 2:20 p.m.
Wendall Cross Elementary School – 8:35 a.m. – 2:50 p.m.
Woodrow Wilson Elementary School – 8:35 a.m. – 2:50 p.m.
Waterbury Arts Magnet School – 9:25 a.m.
Waterbury Career Academy High School – 9:20 a.m.
Wilby High School – 9:20 a.m.
North End Middle School – 9:50 a.m.
Wallace Middle School – 9:50 a.m.
West Side Middle School – 9:50 a.m. Bucks Hill Elementary School – 10:35 a.m.
Bunker Hill Elementary School – 10:35 a.m.
B.W. Tinker Elementary School – 10:05 a.m.
Carrington Elementary School – 10:35 a.m.
Chase Elementary School – 10:35 a.m.
Driggs Elementary School – 10:05 a.m.
Duggan Elementary School – 10:05 a.m.
E.J. Kingsbury Elementary School – 10:35 a.m.
Generali Elementary School – 10:35 a.m.
John G. Gilmartin Elementary School – 10:35 a.m.
Hopeville Elementary School – 10:35 a.m.
Maloney Magnet Elementary School – 10:35 a.m.
Jonathan Reed Elementary School – 10:35 a.m.
Regan Elementary School – 10:35 a.m.
Rotella Interdistrict Magnet School – 11:05 a.m.
Sprague Elementary School – 10:05 a.m.
Walsh Elementary School – 10:05 a.m.
Washington Elementary School – 10:05 a.m.
Wendall Cross Elementary School – 10:35 a.m.
Woodrow Wilson Elementary School – 10:35 a.m.
Crosby High School – 11:00 a.m.
Kennedy High School – 11:00 a.m.
Waterbury Career Academy High School – 11:00 a.m.
Wilby High School – 11:00 a.m.
North End Middle School -11:30 a.m.
Wallace Middle School – 11:30 a.m.
West Side Middle School – 11:30 a.m. Bucks Hill Elementary School – 12:00 p.m.
Bunker Hill Elementary School – 12:00 p.m.
B.W. Tinker Elementary School 11:30 a.m.
Carrington Elementary School – 12:00 p.m.
Chase Elementary School – 12:00 p.m.
Driggs Elementary School – 11:30 a.m.
Duggan Elementary School – 11:30 a.m.
E.J. Kingsbury Elementary School – 12:00 p.m.
Generali Elementary School – 12:00 p.m.
John G. Gilmartin Elementary School – 12:00 p.m.
Hopeville Elementary School – 12:00 p.m.
Maloney Magnet Elementary School – 12:00 p.m.
Jonathan Reed Elementary School – 12:00 p.m.
Regan Elementary School – 12:00 p.m.
Rotella Interdistrict Magnet School – 12:30 p.m.
Sprague Elementary School – 11:30 a.m.
Walsh Elementary School – 12:00 p.m.
Washington Elementary School – 11:30 a.m.
Wendall Cross Elementary School – 12:00 p.m.
Woodrow Wilson Elementary School – 12:00 p.m. When the weather causes a delay or school closing, buses will follow the procedures set by Waterbury Public Schools. The schools’ weather policy can be found here. All students will be dropped-off at their assigned bus stops and must be met by a parent or an authorized adult/caregiver, or they will be returned to his/her home school or to the Waterbury Public Schools Family Intake Center at 1 Jefferson Square, Waterbury. The Center’s phone number is 203-346-3511. All address changes must be made through the student’s school or by utilizing the Waterbury Public Schools Family Intake Center located at 1 Jefferson Square, Waterbury or by calling the Center at 203-346-3511. All-Star Transportation cannot take address changes. It takes All-Star Transportation two to three days to revise a route after it receives documentation for an address change. If you have any questions, please contact All-Star Transportation’s Waterbury office at 203-753-8366 or email [email protected].